If ASEAN was a single country, it would represent the seventh-largest economy in the world. By 2050, management consultants McKinsey predict the economies of South-East Asia could collectively become the fourth-largest in nominal GDP terms. If the figures are adjusted for purchasing power parity, they are already there. Since 2000, nowhere outside China and India has seen more robust economic growth. At the same time, however, South-East Asia performs poorly when it comes to human rights. Throughout the region, the rights to freedom of expression and assembly are under attack. As authorities have rapidly derestricted the flow of capital, they have imposed increasingly greater restrictions on the flow of opinions and ideas – whether online or offline. And at a time when the majority of the world’s countries have turned their back on the death penalty, abolishing this cruel and irreversible practice, the region is seeing a worrying revival in its implementation. For decades, a debate has raged in the region over whether human rights represent a particularly Western tradition that finds little relevance in Asia. 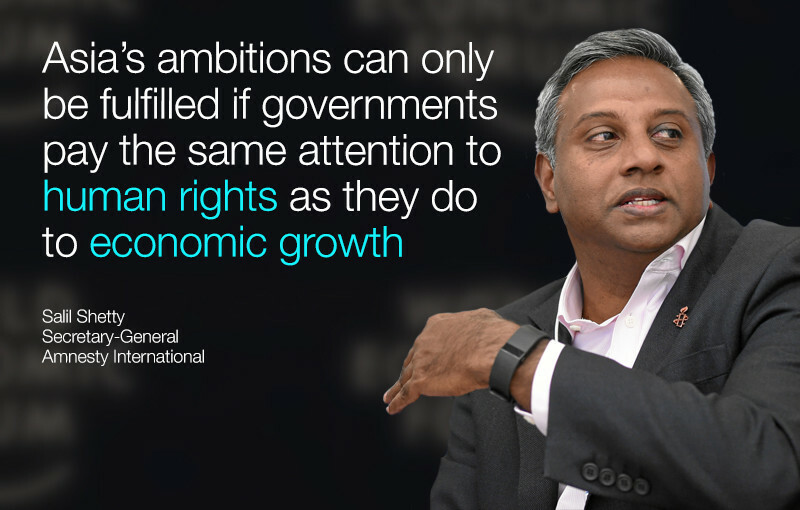 Some influential voices have argued that by protecting human rights, their economic ambitions will be impeded. As an Asian myself, I have to disagree. Nobel-winning Amartya Sen has observed that empirical studies “give no real support to the claim that there is a conflict between political rights and economic performance”. Indeed, by limiting or violating human rights, countries risk thwarting their ability to sustain their economic ambitions and eventually rolling back on progress. In Vietnam, ordinary people took to the streets to demand accountability after vast stocks of fish were devastated by pollution which they believe came from a local factory. The response of the ruling Communist party, ironically to protect the worst excesses associated with capitalism, was to resort to old methods of repression. They carried out mass arrests, intensified surveillance, stopped civil-society leaders from leaving their homes, and imposed a ban on social media sites Instagram and Facebook. No country that wishes to open itself up to the world and attract foreign investment on a sustained basis can afford to act in this way. The resentment that disasters breed creates a climate that is hostile to foreign investment. Governments have a responsibility to protect their citizens from any adverse effects of business activity, and risk inviting political instability and investment flight risk unless they do so. Few compare with Duterte when it comes to bellicose rhetoric. But his methods are not new. The Philippines’ authorities have a grim record of practising torture and other ill-treatment. In one case, a police unit was discovered using a roulette wheel to determine what form of torture they would inflict on a person in custody. These practices led to police notoriety and a failure to establish peace. People should draw little comfort from promises of quick-fix formulas that involve serious violations of human rights. Similarly, the use of the death penalty in countries like Indonesia and Singapore is touted as a solution to crime, but there is no proof that executions act as a more effective deterrent than prison. State repression in the name of national security and public order is almost always disproportionately unleashed upon the poor and vulnerable, further increasing inequality and social conflict, leading to greater instability. If anything, businesses should be worried to seek the protection of authorities who are prepared to use torture, compromise the integrity of the judicial process, and resort to executions in order to appear tough on crime. South-East Asia’s ambitions can only be fulfilled if governments pay the same attention to their human rights record (including a strong emphasis on women's rights) as they do their economic growth rates. Even in the medium term, economic reforms will only prove effective if they are supported by a regulatory framework that closes governance gaps, protects people and ensures that business activity respects human rights, not just for the privileged few but for all. Business leaders should push for states that respect rule of law and protect and promote human rights, creating a virtuous circle of more investment that leaves no one behind. 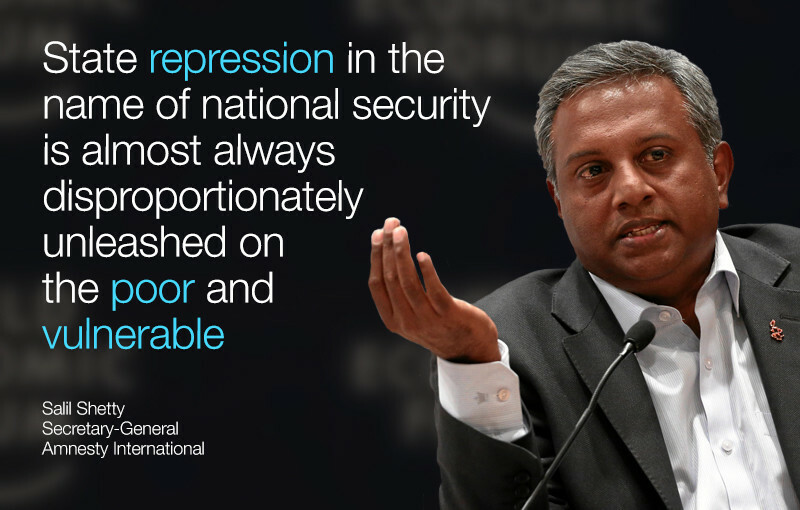 Watch Salil Shetty talking about human rights violations in this Facebook Live video, filmed at the World Economic Forum's ASEAN meeting in Kuala Lumpur.